The annual migration of nearly 2 million wildebeest, zebras and gazelles through Tanzania and Kenya is a spectacle unlike any other. Called one of the "Seven New Wonders of the World," this event highlights movement of immense proportions for wildlife in Africa. The plains are literally covered with migrating wildlife. A few summers ago Larry and I witnessed the Great Migration in early August as the animals journeyed from Tanzania into Kenya. The migration is reversed during the winter. Wildlife follows a predictable route, but the exact timing varies each year, depending on the start and severity of the dry season throughout eastern Africa. Wildebeests and zebras typically spend December to April in Tanzania, nursing new calves born in the spring. 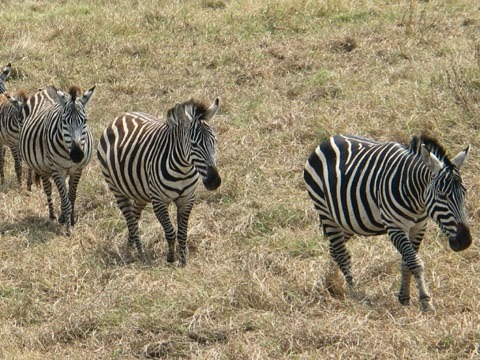 The slow-moving calves draw the attention of lions, cheetahs and hyenas, and this mix of predator and prey offers prime wildlife-viewing opportunities in nature preserves like Serengeti National Park and the Ngorongoro Conservation Area home of the greatest concentration of mammalian predators in the world. Wildebeests make up the majority of migrating wildlife. Seasonal rains usually end in May. Grass and leaves begin wither, and to maintain their constant foraging, grazing species are forced to move west and then north in search of food. 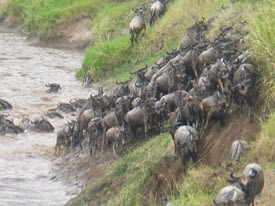 This is the start of the Great Migration, a steady stream of animals in columns that can stretch for many miles, heading toward the western and northern Serengeti. Predators -- more territorial than migratory -- await the zebra and wildebeest as these animals pass through their hunting grounds. The migrating herds must cross the Grumeti River, where crocodiles will feast on the weak and the slow. Scavenging birds watch from treetops and circle overhead. June and July are typically the best months for witnessing the Great Migration in the western and northern Serengeti of Tanzania. 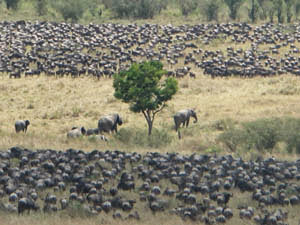 grass that has been left as the wildebeests moved on. As the summer progresses, the herds travel farther north. Between July and August, they cross the Mara River, where some are lost in surging floodwaters and others are seized by waiting crocs. 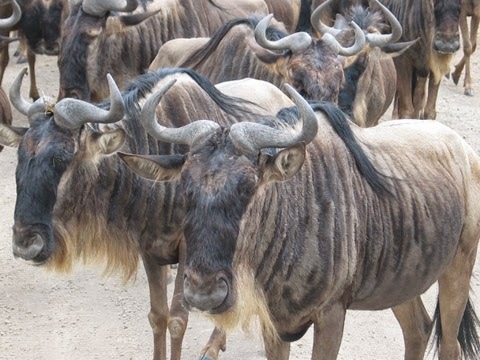 They move into Kenya, typically reaching the abundant greenery of the Masai Mara in August or September, a dazzling number of animals within a single nature preserve. Some naturalists claim that the Masai Mara contains the largest concentration of predators along the migratory route which makes it especially dangerous for the oldest and youngest of the species. We witnessed several examples of “the nature of things” during our visit. The animals stay there until October or November. River; crocodiles are waiting for any that may falter. Most safaris visit the area before fall brings another rainy season to the plains, and the herds turn south toward Tanzania. The animals that complete the journey will have traveled more than 1,800 miles, covering Africa's vast grasslands in a clockwise direction. Watching huge clouds of wildlife on the move, attempting to stay alive by finding new feeding grounds and evading predators, is truly a unique experience worth planning your Africa visit around.